This course is for drivers who wish to upgrade their driving skills from Medium or Heavy Rigid to a Semi-Trailer. Call Ideal now to see which course best suits your driving needs. Heavy rigid and trailer of more than 9 T GVM or prime-mover & semi-trailer. 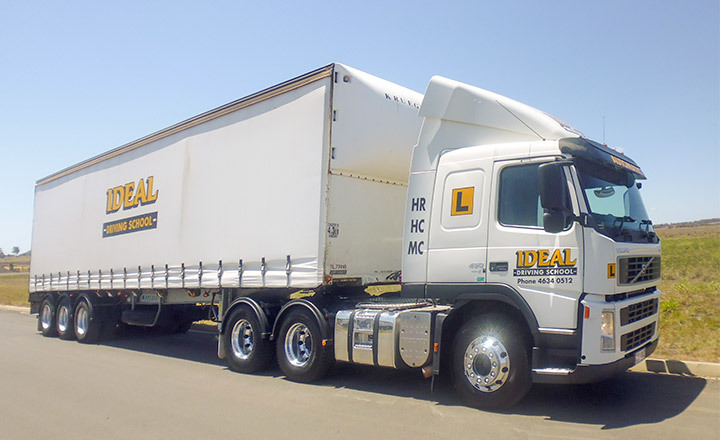 Ideal's comprehensive driver training includes many must-know driving skills that your employer will expect you to have. Queensland Transport requires that the student has held a Medium Rigid or Heavy Rigid licence for a period of one year (1 year). Ideal Driving School conducts one hour lessons and training is competency based. Once the student is competent with their Heavy combination driver licence training a practical driving test with Queensland Transport can be booked. The student will complete the test in the same training vehicle with the Queensland Transport examiner. Lessons required to attain a DOT licence. On average the number of lessons for a person upgrading from a Medium Rigid to a Heavy Combination is approximately 8 one hour lessons. Upgrading from a Heavy Rigid Combination to Heavy Combination is around 5 one hour lessons. Additionally there is the hire of the truck for one hour whilst undertaking the Queensland Transport test.